CBD products are on trend right now: from gummies to tinctures to lotions to oils, the versatile hemp derivative has a potential slew of benefits. Many people ingest CBD to reduce anxiety, relieve pain, and attack insomnia. However, there’s another population that might benefit from CBD: dogs. If your dog frequently seems anxious or cowers behind the couch during thunderstorms, you may want to try adding a few drops of Pet CBD Oil to his food. 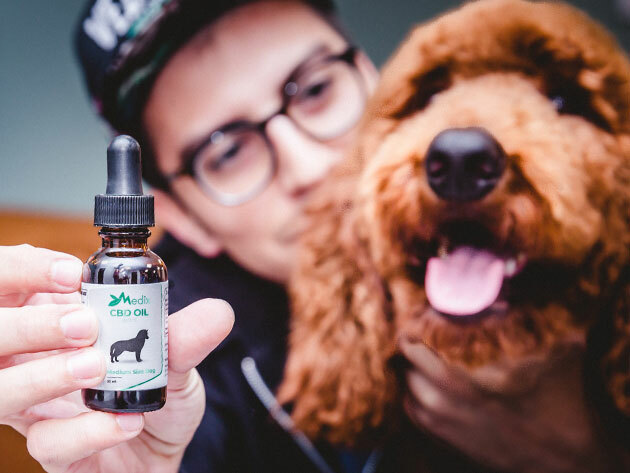 This bottle of Pet CBD Oil is designed for large dogs who need a little help when it comes to staying calm. Just one dropper full of the oil might ease your dog’s arthritic joints. It may also reduce symptoms of chronic conditions, like nausea that comes with canine cancer treatment or the loss of appetite that accompanies certain medications. The oil contains less than 0.3% THC, so it’s legal to try and won’t give your dog the munchies. This tincture’s bacon flavor makes it easy to add to your dog’s food or favorite treats. It can be particularly helpful if your dog is under duress and refuses to swallow pain medication or anti-anxiety pills. Usually, 30 servings of this Pet CBD Oil costs $49.99, but you can chill Fido out right now for the sale price of $35 (29%).